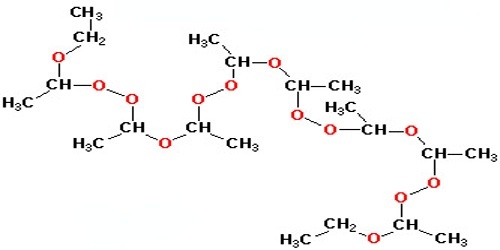 Peroxide is a compound containing the group O2. Peroxides are strong oxidizers and are used as industrial bleaches. When any peroxide is combined with an acid, one of the products is hydrogen peroxide. The simplest stable peroxide is hydrogen peroxide. Superoxides, dioxygenyls, ozones and ozonides are considered separately. Peroxide compounds can be roughly classified into organic and inorganic. Whereas the inorganic peroxides have an ionic, salt-like character, the organic peroxides are dominated by the covalent bonds. Hydrogen peroxide, H2O2, is a simple peroxide compound. Other inorganic peroxides are known. These are classified as either ionic peroxides or covalent peroxides. Ionic peroxides contain alkali metal ions or alkaline earth ions as their cations. 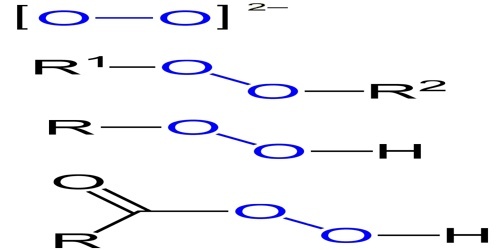 Covalent peroxides include hydrogen peroxide and also peroxymonosulfuric aicd (H2SO5). Technically superoxides, ozones, ozonides, and dioxygenyls are peroxide compounds, but they tend to be considered separate because of their special characteristics. Peroxides are compounds in which there is an oxygen-oxygen bond, -O-O-. Oxygen atoms stick together in pairs to form oxygen gas, O2, and in threes to make ozone, O3, but do not form longer chains, as sulphur does so readily. These gases are not considered to be peroxides. With hydrogen, oxygen forms the remarkable compound H2O, water. In 1818, Thénard discovered that it made another hydride, H2O2, hydrogen peroxide, which was similar to water but had peculiar properties. 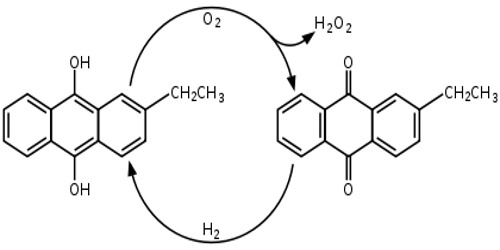 This article will look at these oxygen compounds, with an emphasis on hydrogen peroxide. Peroxides are potent oxidizers, capable of causing serious chemical burns. Certain organic peroxides, such as TATP (triacetone triperoxide) and HMTD (Hexamethylene triperoxide diamine), are highly explosive. It’s important to understand these highly unstable compounds may be made by accident by mixing together acetone or other ketone solvents with hydrogen peroxide. Peroxidic compounds should be stored in opaque containers, in cool, vibration-free locations. Heat and light accelerate chemical reactions with peroxides and should be avoided. Hydrogen peroxide can decompose into water and oxygen, H2O2 → H2O + (1/2)O2, releasing 26.04 kcal/mole, or 766 cal/g, or 1380 Btu/lb. It does not do this spontaneously, since the reaction involves creating oxygen atoms, which is energetically very unfavorable. That is, there is a high barrier to the progress of the reaction, although the final result releases energy. The reaction is catalyzed by metals, most acids, and even surface roughness. Kept cool in the dark, in a clean, smooth bottle, peroxide will survive. In ether solution, peroxide is more stable than in aqueous solution. If strongly heated, or exposed to a platinum catalyst, concentrated peroxide will decompose explosively into steam and oxygen. 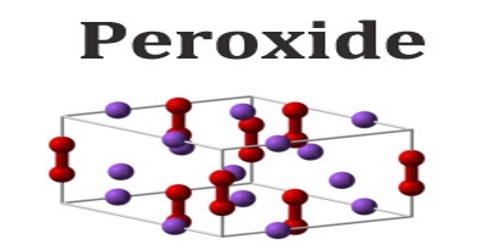 Peroxides occur naturally in small amounts in plants and animals, water, and the atmosphere. In humans and other animals, hydrogen peroxide is a by-product of biochemical reactions. The chemical is short-lived, but is toxic to cells because of its ability to oxidize DNA, proteins, and membrane lipids. This toxicity makes peroxide useful as a disinfectant, to kill bacteria and other pathogens. However, nearly all eukaryotic cells purposely form peroxide in organelles called peroxisomes. Peroxisomes are used for catabolism of fatty acids, D-amino acids, and polyamines and for biosynthesis of compounds essential for normal lung and brain function.